The 150-acre UA Little Rock main campus features buildings finished in glass, concrete, and orange brick and wooded areas of pine and oak trees. Most of the buildings were built after 1970, and none was built before 1947. The campus features two fountains, most notably the Elizabeth Cooper Fountain west of Student Union Building A. The Administration building consists of two separate sections, Administration North and Administration South, linked by an outdoor atrium. The former Administration South building is home to the Department of Nursing. This state-of-the-art facility is the product of a $7 million dollar renovation project. This facility houses a simulation laboratory and cutting-edge technology used to train our next generation of nursing professionals. The Administration North houses the Office of Financial Services, Student Accounts, and the cashier on the ground level floor. Contains over 8,200 square feet and is available to campus and community groups for meetings, programs, and social functions, is home to the Alumni Association, Office of Community Engagement, Friday Leadership Program, and University District. UA Little Rock students can attend classes at our Benton Center and enjoy the convenience of staying close to home as they pursue their studies. Completing a 4-year Bachelor’s degree at the Little Rock campus is a seamless transition – no transfers required! UA Little Rock courses are taught at Benton by UA Little Rock faculty. Students have regular student privileges at the UA Little Rock campus and are subject to regular academic policies. Services offered at UA Little Rock Benton include textbook sales and buy-back (for classes taught there) as well as academic advising and financial aid assistance (by appointment only). Is located on the south end of the UA Little Rock campus, houses the Department of Theatre Arts and Dance and consists of two theatres. University Theatre, the main performance venue, is a 650-seat proscenium theatre-the site of academic activities, theatre and dance, and programs of public interest. Haislip Arena Theatre, also known as Studio 127, accommodates up to 140 attendees. The five-story, LEED-certified Center, built in 2012, houses over $5 million worth of analytical equipment. The 4,695 square-meter facility meets all federal, state, and local government laws and regulations regarding airborne emissions, waterborne effluents, external radiation levels, outdoor noise, solid and bulk waste disposal practices, and the handling and storage of toxic/hazardous materials. The Center runs several instrumentation laboratories, including two spectroscopy laboratories, an x-ray diffraction laboratory, an atomic force microscopy laboratory, and an electron microscopy facility, as well as 10 research laboratories. Houses the Office of Communications and Marketing, which provides the campus community with a variety of communications services, including advertising and marketing, public relations, graphic design, web design, special events, and media training. Opened in spring 2000, houses the College of Education and the Departments of Mathematics and Statistics, Educational Leadership, and Teacher Education, as well as offices for the Academy of Teaching and Learning Excellence (ATLE) and Scholarly and Technology Resources (STaR). 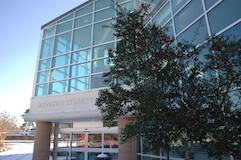 The Donaghey Student Center (DSC) provides facilities and services unique to university life. The 205,000 square-foot building opened on August 16, 1993. The DSC combines a traditional student center with a fitness and aquatics center. The DSC houses the Office of the Vice Chancellor for Educational and Student Services/Dean of University College, the Office of Campus Life, University Program Council, Student Government Association, Health Services, UA Little Rock Bookstore, UA Little Rock Forum, UA Little Rock Dining Services, Disability Resource Center, Cyber Cafe, DSC Fieldhouse, the multifunctional Fitness & Aquatics Center, and much more. The Fitness & Aquatics Center houses fitness equipment and Central Arkansas’ only indoor Olympic-sized pool. The DSC offers meeting and event facilities to accommodate conferences, meetings, banquets, special events, sports/recreation, and aquatic events (501-569-3324). Additionally, the DSC manages the UA Little Rock Campus Card (official University ID), which provides access to the Ottenheimer Library, the DSC Fitness and Aquatic Center and residence halls, and may be used as a meal card in dining services. The Donaghey Student Center is professionally affiliated with the National Association of College Auxiliary Services, the Association of College Unions-International, and the National Intramural-Recreational Sports Association. For more information about the facilities and services call (501) 569-3362 or visit the website. The Earth Sciences Building was completed in 1959 as a complex to house all the life sciences. It was completely remodeled in 1975 and now houses teaching, research, and sample laboratories for the Department of Earth Sciences, biology research laboratories, and a mathematics laboratory. The Education Building (formerly the North Building) and John A. Larson Hall (formerly the South Building were the first buildings erected on the campus when the institution moved to its current site in 1949. For many years the two buildings provided classrooms, faculty offices, administrative offices, and laboratories for the small but growing college. The Education Building now houses the Center for Applied Studies in Education while Larson Hall houses the School of Social Work and Dean of Extended Programs. 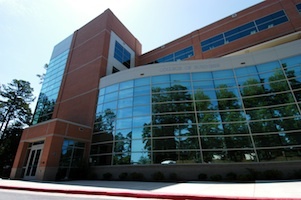 The Engineering and Information Technology Building was completed during the summer of 2010 and houses the Donaghey College of Engineering and Information Technology dean’s office as well as Departments of Computer Science, Information Science, Systems Engineering, and the Midsouth Bioinformatics Center. The building is the first LEED gold facility in the University of Arkansas System. LEED, or Leadership in Energy and Environmental Design, is the nationally accepted program for benchmarks in design, construction, and operation of high-performance green buildings. Gold certification is the second highest level of certification. The Engineering Technology and Applied Sciences Building was completed in 1987, houses the Graduate Institute of Technology and the departments of Construction Management and Engineering Technology. The 180,000 square foot building also houses parts of the Donaghey College of Engineering and Information Technology. The Facilities Management Building, formerly the Seymour Terry Army Reserve Center, was leased to UA Little Rock in 1990. 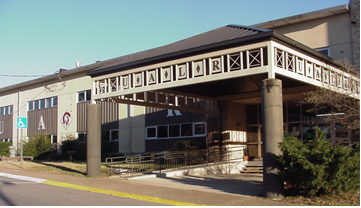 The 2.66-acre site was constructed in 1951 and now houses Facilities Management and MidSOUTH Center for Leadership and Training, a program of the School of Social Work. MidSOUTH also administers the Academy for Family-Centered Training at the Baker Building at Markham and University. The Fine Arts Building, completed in the fall of 1977, houses the Departments of Art and Music as well as the Community School of the Arts. In addition to general classrooms and highly specialized instructional space for the two departments, the building includes three galleries and the 312-seat Stella Boyle Smith Concert Hall, which was renovated in 2010. James H. Fribourgh Hall (formerly the Natural Sciences Building, initially completed in 1975), contains laboratories, faculty offices, classrooms, and other facilities for the Departments of Earth and Life Sciences as well as the Planetarium with its 40-foot dome. The building also houses the Arkansas STRIVE Program of the Arkansas Small Business and Technology Development Center. The Ottenheimer Library contains more than a half million print books and provides online access to over 50,000 electronic journals, 18,000 electronic books, and 200 scholarly databases. Online access is made available via the library’s Website. Members of the library staff look forward to working with you in support of your research and instructional needs. If there is any way we can better serve you, please let us know. Reference Collection: Reference materials are located on the 1st floor. Government Information: Physical copies of U.S. government publications are located on the 1st floor and most are available for circulation. Reserve Items: Reserve items are located on the 1st floor. Materials placed on reserve by an instructor may be obtained from the circulation desk. Journals: Journals are located on the 3rd floor and are arranged in alphabetical order by title. Circulating Materials: Circulating materials are on the 4th and 5th floors. Library of Congress call numbers beginning with A-QA79 are on the 4th floor. The sequence begins in the northwest corner and ends in the middle of the floor on the east side. QA80-Z call numbers are on 5th floor. This sequence begins on the southwest side of the floor and ends at the southeast side. Photocopiers/Scanners: A campus ID is required to make copies; money can be added to the campus ID at a value station located on the 1st floor. Copies are 10 cents for black and white and 20 cents for color. Users without a campus ID can purchase a blank copy card at the circulation desk for $1.00. Scanning to e-mail or a USB drive is free. There are four book drops located throughout the campus. Materials can be returned at any of the book drops twenty-four hours a day. Please see Book Drops for locations. The fifth floor houses the offices of Research and Sponsored Programs; Institutional Research; Research and Sponsored Programs; and the Graduate School. With the UA Little Rock Center for Integrative Nanotechnology Sciences, Arkansas is well poised to take advantage of this exciting new world of economic opportunities and capitalize on nanotechnology breakthroughs discovered at UA Little Rock and other universities throughout the state. 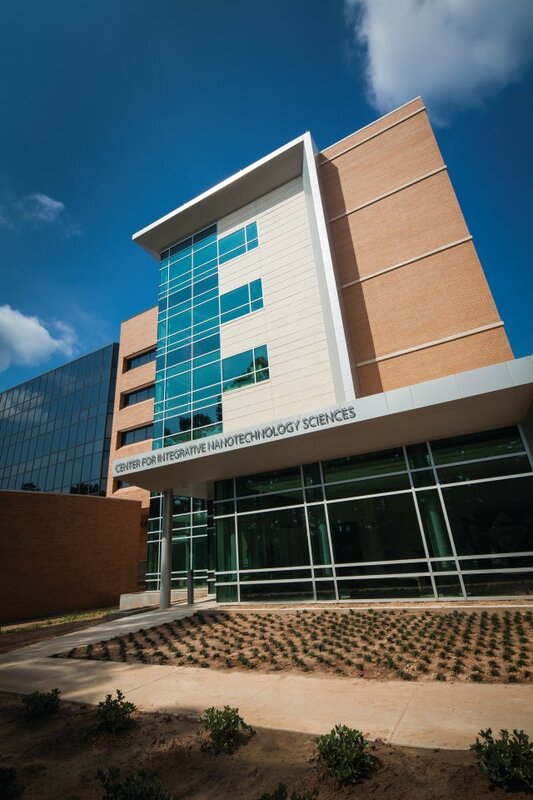 The Center for Integrative Nanotechnology Sciences is a state-of-the-art, user-oriented facility focused on research, education, and economic development. The Parking Deck, which opened in 1992, is located east of the Donaghey Student Center. It is open to students, employees, and visitors for $1.00 per exit. Reserved parking is provided on the deck’s lower level. The Physics Building houses the Department of Physics and Astronomy, including classrooms, laboratories, and departmental offices. The building was erected in 1967 and renovated in 1975. The Donald W. Reynolds Center for Business and Economic Development, completed in 2002, is a 98,700-square-foot-building that contains 150 offices, an auditorium, atrium, library, and 13 modern classrooms. The building houses the College of Business as well as the Departments of Management, Accounting, Economics and Finance, and Marketing and Advertising. 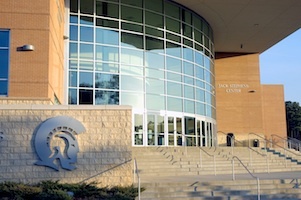 In addition, the Arkansas Small Business and Technology Development Center and the Institute for Economic Advancement make their homes in the Reynolds building. G. Robert Ross Hall (formerly the Business Administration Building) opened during the 1981-1982 academic year. It houses the Offices of Academic Advising, Cooperative Education, Counseling and Career Planning, and Testing Services and Student Life Research. In addition, it is home to the Department of Criminal Justice, Institute of Government, College of Professional Studies, and the Military Science ROTC Program. It includes general purpose classrooms, including two small lecture halls. 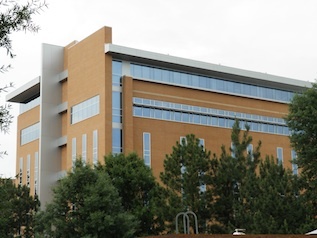 The Science Laboratories Building, adjacent to Fribourgh Hall, was completed in 1998 and added 80,000 square feet for the Departments of Biology, Chemistry, and Earth Science. The first two floors house classrooms and teaching laboratories. The third and fourth floors are research laboratories for the biology and chemistry departments. In addition, the chemistry department’s office is located on the fourth floor. The Speech Communication Building, completed in 1976, houses the Department of Speech Communication, Academic Success Center, Arkansas Advanced Initiative for Math and Science (AAIMS), and the Office of Purchasing. Stabler Hall was completed in 1973 and renovated in 2009, launched UA Little Rock’s concept of constructing taller buildings to conserve space. The seven-story structure features a 200-seat lecture hall on the first floor and an observatory on the roof. The building houses the Departments of Psychology, Sociology, and Anthropology, Political Science, Philosophy and Liberal Studies, English, Geography, and History. The School of Mass Communication, Department of World Languages, Nonprofit Leadership Studies and faculty in the College of Arts, Letters, and Sciences also occupy classrooms in the building, which houses the campus television station. UA Little Rock offers a variety of housing options to meet the needs of the diverse student body. The East Hall is a traditional suite style, furnished, co-ed, two bedroom units shared by four students. Includes kitchenette, bath, and living area. The University Courts are Non-Traditional Student Housing and are reserved for non-traditional students over 21. These one bedroom/one bath apartments include full kitchens, cable, and wireless internet. UA Little Rock also owns several houses in the Oak Forrest neighborhood. These unfurnished houses are available for student, faculty, or staff families. The Office of Student Housing maintains lists of individuals seeking roommates and apartments, townhouses, duplexes, rooms, and mobile homes available in greater Little Rock. The office also has apartment guides, commercial and private listings, brochures, and other information. All rental arrangements on privately owned accommodations are between the renter and tenant. UA Little Rock adheres to all federal and state regulations and guidelines regarding nondiscrimination in housing. Inquiries may be made to the Office of Student Housing at (501) 661-1743 or by visiting online at https://ualr.edu/housing/. The Dr. Charles W. Donaldson Student Services Center is located adjacent to the Ottenheimer Library and adjoins the Donaghey Student Center by a sky walk. The building houses Administration (Office of the Chancellor, Provost and Vice Chancellor of Academic Affairs, Vice Chancellor of Finance and Administration, and Vice Chancellor of University Advancement), The Office of Admissions & Financial Aid, Office of Records and Registration, Bursar’s Office (Student Accounts) and Cashiers Office, Academic Advising (University College), Private Scholarships, Veteran Affairs, and the Office of Transfer Student Services. The building also includes a 205-seat auditorium. Student Union Building (SUA) A, which houses Mail Services and the Center for Gifted Education, also houses the College of Arts, Humanities, and Social Studies Learning Technology Center. Within the center, SUA 106 Classroom Suite provides classrooms devoted to writing, graphics, and audio. SUA 102 Core Classroom Suite houses classrooms specifically designed for technology-enhanced core curricula within the college. Student Union Building B, built in 1969, houses Computing Services on its upper floor and the Department of Rhetoric and Writing, Little Rock Writing Project, and University Writing Center on its ground floor. The William H. Bowen School of Law is located downtown at 1201 McMath Avenue in the 152,000-square-foot Law Center adjacent to MacArthur Park. UA Little Rock Children International, located just east of the campus at 2510 Fair Park Boulevard, provides office space and a service-learning site for more than 300 UA Little Rock and UAMS students, faculty, and staff who serve as trainers, mentors, tutors, and health care professionals at seven elementary schools. University Plaza is a 22-acre shopping center bordering Asher Avenue directly south of the campus, was purchased and renovated in 2005. This space is now home to the public radio stations KUAR and KLRE, the Sequoyah National Research Center, the Applied Arts Program, the Department of Audiology and Speech Pathology, the Department of Public Safety, and components of the Department of Construction Management. In addition, the all-important UA Little Rock Welcome Center, home of the Office of Recruitment, is located in the plaza’s parking lot. The University Services Building completed in 1974, provides a convenient location for the Office of Human Resources, Communications and Marketing, and Printing Services.